The inauguration and handover of the Centre for Jeratar Creative Women’s Community at Jeratar, Panchkhal-12,in Kavrepalanchok district took place on Sunday, 16 July 2017. Jeratar is wildly populated by the community of Danuwar people. A total of 3434 Danuwars is found in Jaretar. Due to the devastating earthquake of 25th April 2015, the village was drastically damaged. Most of their house are not yet rebuilt. Jeratar Creative Women’s Community is a group organized by the local women, mainly of Danuwars for the purpose of capacity building and training for women and girls who are marginalized and lack opportunities for livelihood options. The group has nearly 60 members. 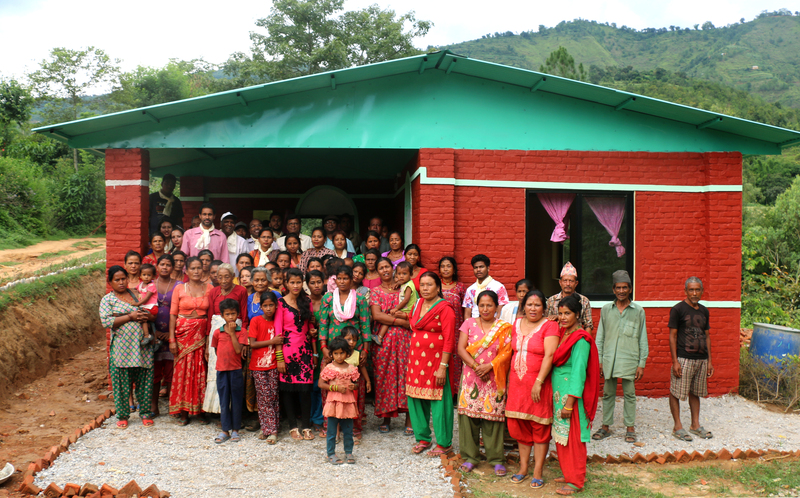 Nepal Jesuit Social Institute has been supporting the families at Jaretar since soon after the earthquake in April 2015 and has conducted various livelihood training programs, such as; soap making, candle making, glass beads garland making etc. The women group found it very useful and economically supporting their lives and they continue to make such products. The new building constructed by Nepal Jesuit Social Institute was financially supported by Caritas Germany. Now the center has a room for storing the products made by women groups and a multipurpose hall for meetings and training program.The women group along with their supporters from the village welcomed the NJSI team and expressed their heartfelt gratitude to both NJSI and Caritas Germany for their contribution and support to them. They also requested for further support from us. After the inauguration ceremony by Fr. Boniface Tigga. SJ ( Superior of Nepal Jesuits), Ms. Laxmi Danuwar, the Assistant Mayor of Panchkal Municipality received the keys of the new building from Fr. Roy Sebastian, SJ (Director of NJSI) and handed it over to Ms. Rita Danuwar, the president of Jaretar Creative Women’s Community. Fr. Arul Anandam, SJ (Regional Director NJSI) received a special token of love and appreciation for his hard work and continued support in the construction process and other activities.